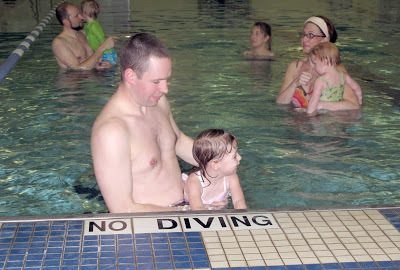 I learned yesterday that I cried through my first swim lesson. Apparently, Mom took me to a class called “Diaper Dip,” which prompted her to worry if I’d ever like the water. (She said I was younger than Cate, so I must have been a year or so old to have done something like that during the summer.) I’m not sure when I decided the water was fun, but I never remember being scared, so I guess it was pretty early on. I do have memories of swim lessons when we were older, and I swam for Tom Sawyer State Park for four summers + Oldham County High School for the two years (my sophomore and senior years) it had a team. 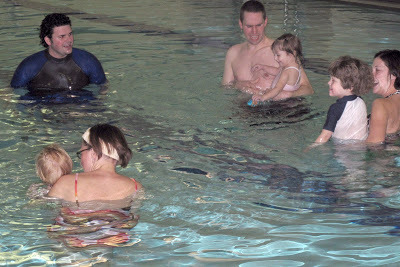 Well, it’s winter now, but Cate had her first swim lesson last night. 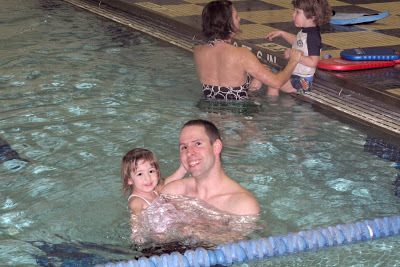 (Although, faithful blog readers know I wasn’t shy about introducing her to water last summer!) There are four kids in the class, and two of the others have to be her friends Luke + Pierson, who are both a year older. The other girl is just a few weeks younger than Cate. I’m glad she was excited about the water, and didn’t really even want to get out when it was finished. She blew bubbles (although might have ended up drinking more water than actually creating bubbles …), kicked + leaned back on Daddy (see above …). … although she more interested in the ball. She goes back every evening this week, so I’m sure I’ll have more stories + pictures. 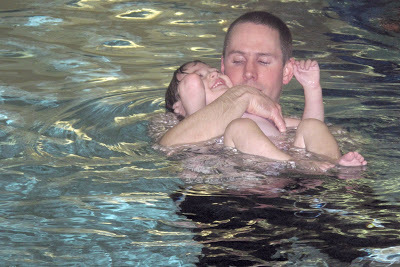 Aren’t swim lessons fun? Evan’s already been asking when he can take lessons again. 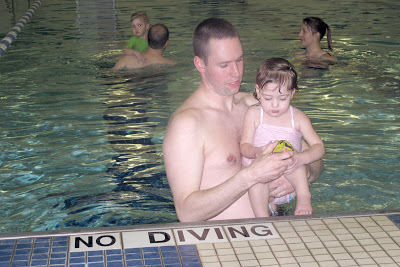 Kristin–I remember your swimming days-especially the trips to shelby County for practice. you really enjoyed the process of seeing yourself improve. Cate looks like she likes the water.